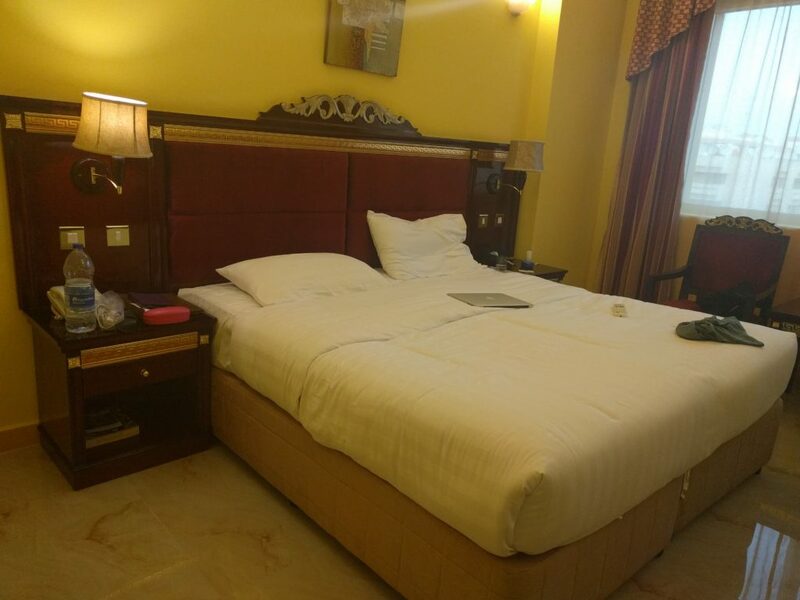 We spent about 36 hours in Dubai, a city in the United Arab Emerates (UAE) that has experienced HUGE growth and development within the past ten years or so. We arrived close to 6:00 p.m. on Sunday, April 9th, and took an Uber back to the airport in the wee hours of the morning on Tuesday, April 11th, to fly to Athens. It was a quick visit that wasn’t on our initial travel itinerary; Aaron had been researching flights from Bangkok to Athens, and due to cost, travel time, and convenience, it made sense to build in a layover in Dubai to break up the trip and experience a totally different culture than we had been exposed to on this long-term travel journey of ours thus far. 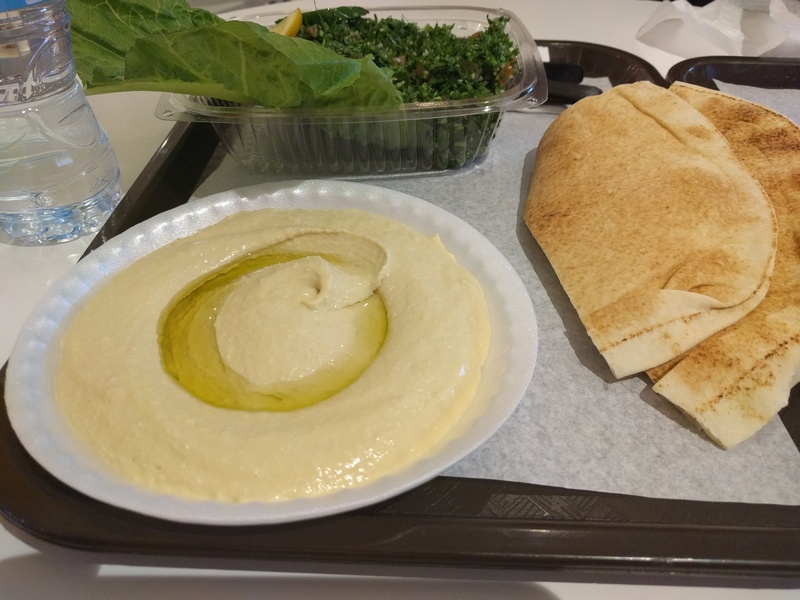 It was such a stark and interesting contrast to encounter Thai, Arab, and Greek cultures within such a short amount of time, within just hours of one another! Neither Aaron nor I had ever experienced being in a Middle-Eastern country before. The primary visual characteristic we noticed almost immediately were the number of people in traditional Islamic and/or Arab dress. Some women had everything but their eyes covered, while others wore modern clothing with a headscarf. Many men were also dressed in traditional attire. (I found this article that overviews what Islamic and Arab clothing looks like and what each piece is called, in case you’re interested in learning about this further). 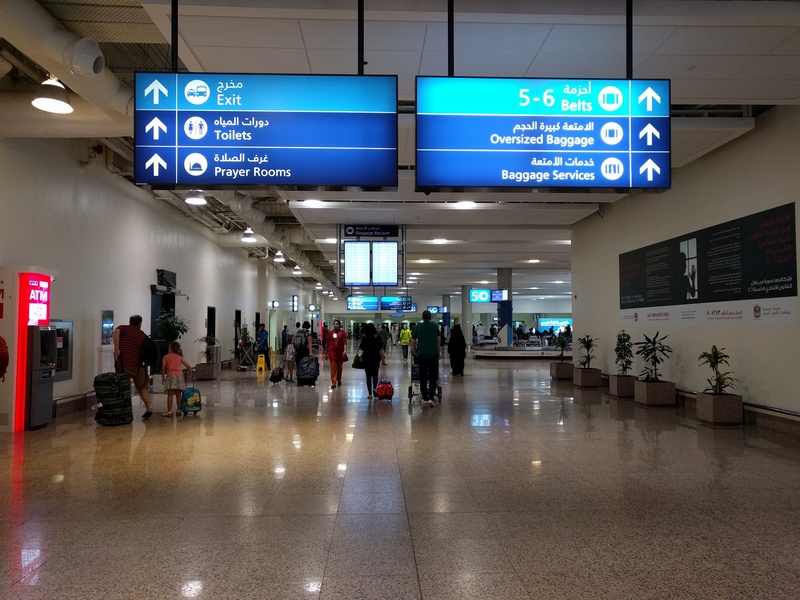 Signage that was written in Arabic was also written in English at the airport, and in most places we visited in Dubai, which was good for us considering we can make out zero of what look like continuously connected characters mean (okay, at the airport we probably could have figured out where to go based on the graphics that accompanied them). In this part of the world, there are prayer rooms at the airport (we also noticed these in Taipei during our layover at the airport on our way to Bangkok as well, which had them designated for a few different, major world faiths). For our first time while using Uber, the driver left his car parked in the Arrivals parking lot and was waiting outside of a designated area near the Arrivals exit. It took us awhile to figure this out, as usually the driver pulls up in their car to meet you where you are waiting for them (for those who haven’t used Uber before), and his location on the map within the Uber app was showing that he wasn’t moving but was super close to us (which made sense once we knew he was parked). We navigated ourselves to the car’s location and knew by the make/model and license plate number that it was his, so we waited there. There were instructions within the app about where to wait for the driver upon exiting the indoor Arrivals area, and it seemed to us we were close to that spot outside of Arrivals, but apparently we were off because we gathered then that he was likely waiting, without his car, in that spot. How would he have found us this way? Did he start calling out my name and no one responded? Surely he wouldn’t have had a sign with my name on it because we requested his services through the Uber app upon picking up our baggage from baggage claim and heading out the Arrivals door, minutes prior. 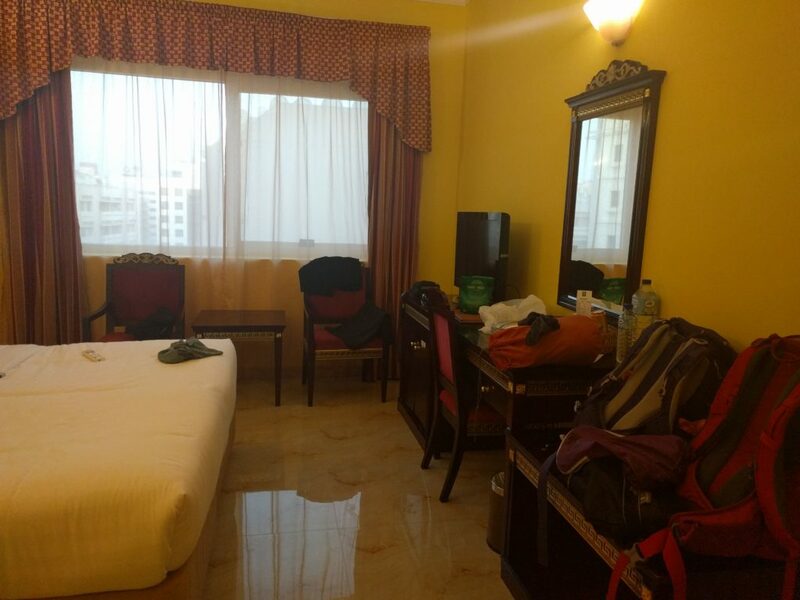 Regardless, standing and walking around in the dry, desert heat that enveloped us as we stepped outside, with our backpacks on, trying to figure this out, was not something we were too happy about after our early and long journey from Bangkok; we just wanted to get settled into our hotel room and eat dinner! We were slightly annoyed by the time he returned to his car to find us standing there waiting, but he explained where he was waiting for us and seemed sorry to keep us waiting. Perhaps this is the norm for Uber pickups at the Dubai airport and Uber is just not explicit about the process here? Also, the exact spot near Arrivals was not easy to navigate to, and usually knowing where the driver (with their car) is, we are on the lookout for their license plate number and can intercept them. In any case, as always, it worked out, and we were eventually on our way to our accommodation. 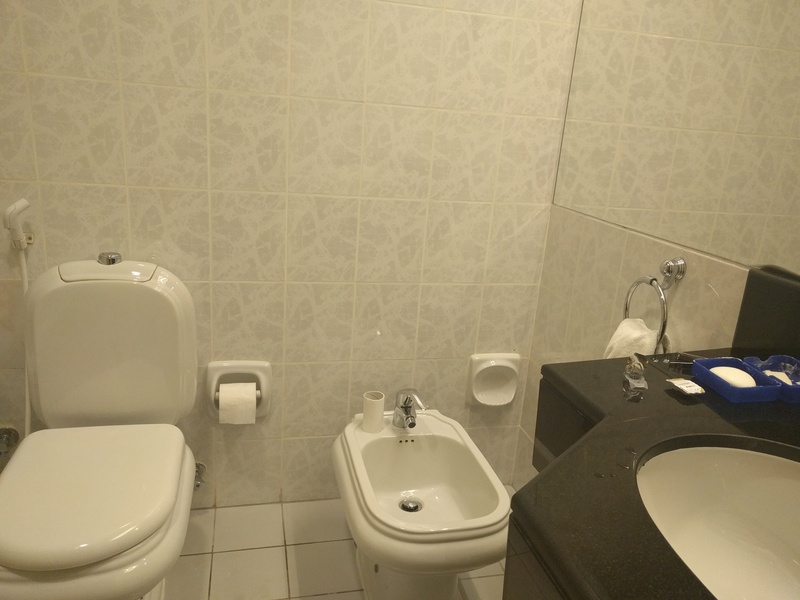 We stayed at Comfort Inn Hotel, which was modern and felt pretty nice for the price in this area (about $45 USD per night). The tabouleh salad was dry, primarily parsley with touches of bulgar wheat and chopped tomatoes. We supposed we were back to expecting the quality to reflect what we pay for based on U.S. currency! 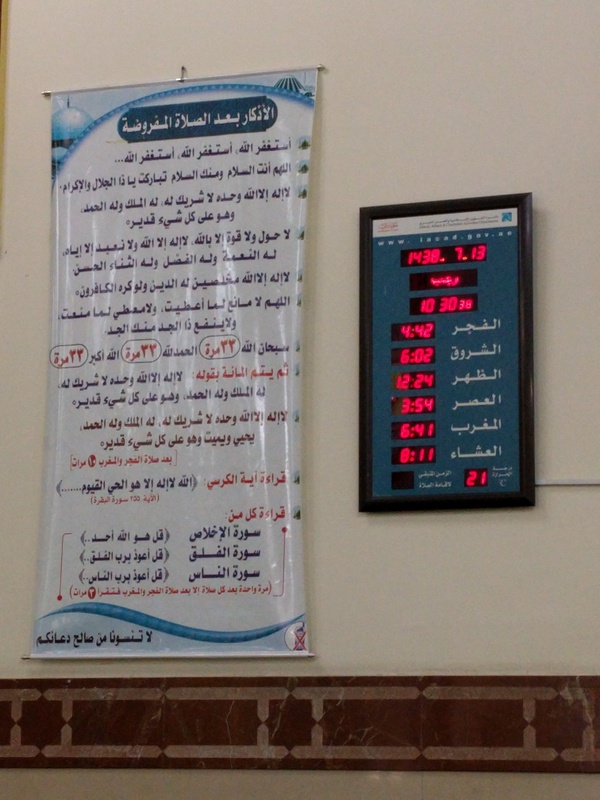 Our options were limited since our ATM card wasn’t working in the machines we tried, so we weren’t able to take out local currency (Dirhams, which currently $1 USD is equivalent to DH 3.67) and had to go somewhere that accepted credit cards. 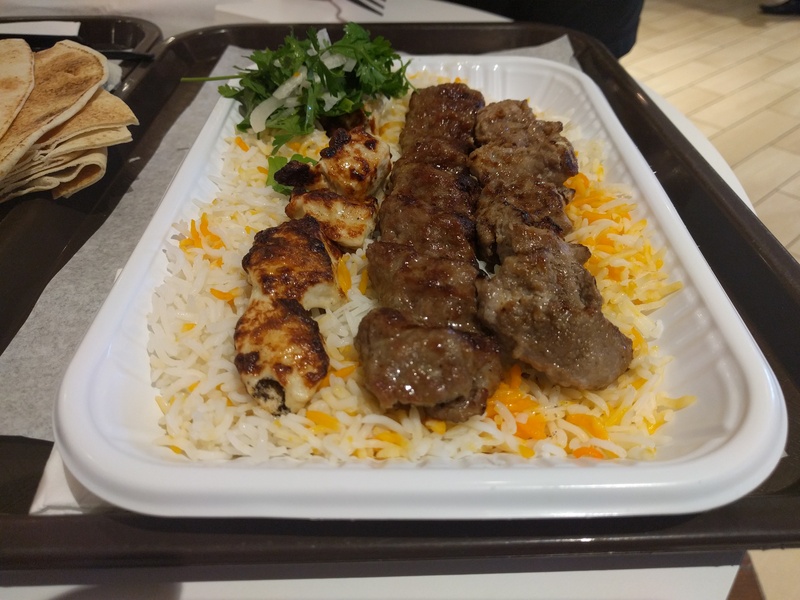 We surmised the random, local spots we saw nearby did not and were too hungry after our long flight to wander around in the early evening figuring it out by trial and error. We also didn’t want to spend money on a pricey meal in a sit-down restaurant. So, to the food court in the mall we went! 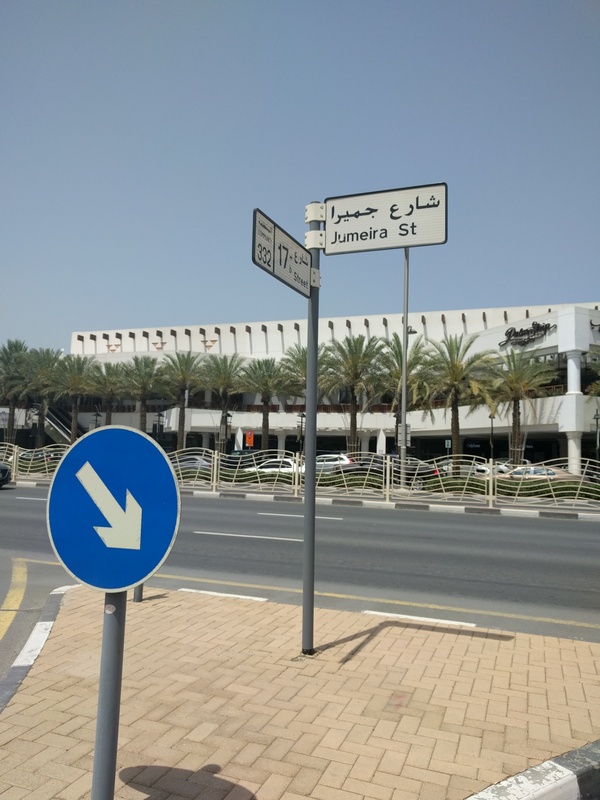 The next morning, after drinking mediocre lattes at our hotel, we headed to the main event of our short time in Dubai, where we were hoping to get some deeper cultural exposure beyond what appeared on the surface. 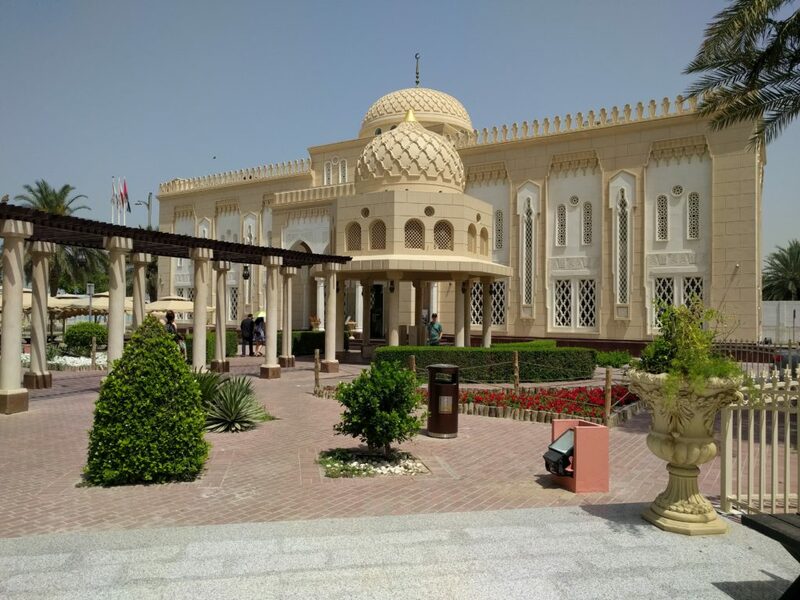 The Sheikh Mohammed Centre for Cultural Understanding offers a guided tour, presentation, and cultural Q&A session at Jumeirah Mosque, led by an Emirati, for non-Muslims, for only AED (Arab Emirates Dirham) 20 per person (about $5.50 USD). 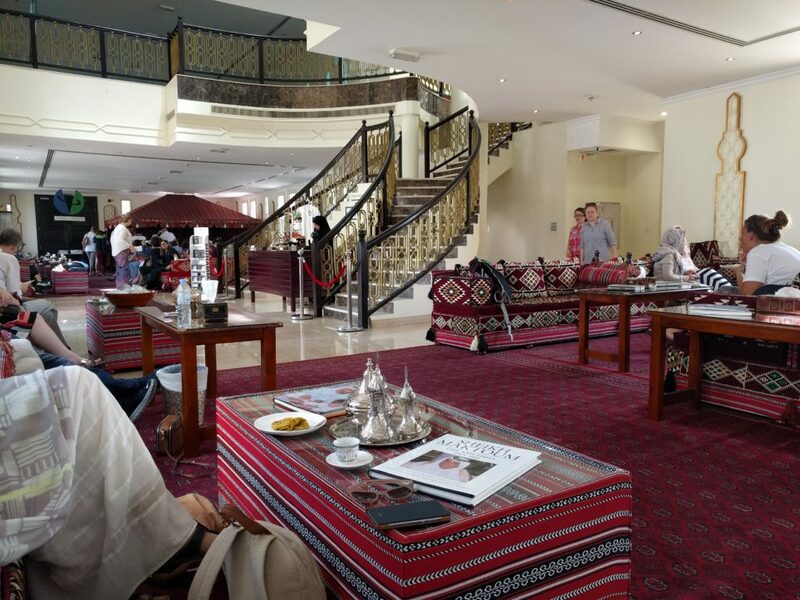 Their motto is, “Open Doors, Open Minds“, and they openly share about their Emirati culture and religion in a relaxed, comfortable atmosphere. 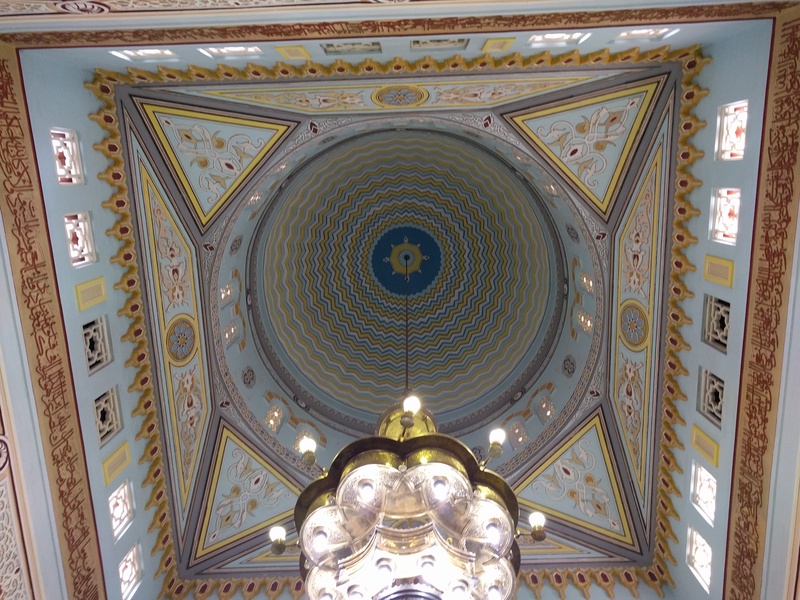 I learned so much about Islam, of which I knew very little about prior to our visit. Aaron had learned some aspects about it on a prior trip he made to Turkey, but this activity built upon what he’d previously learned. 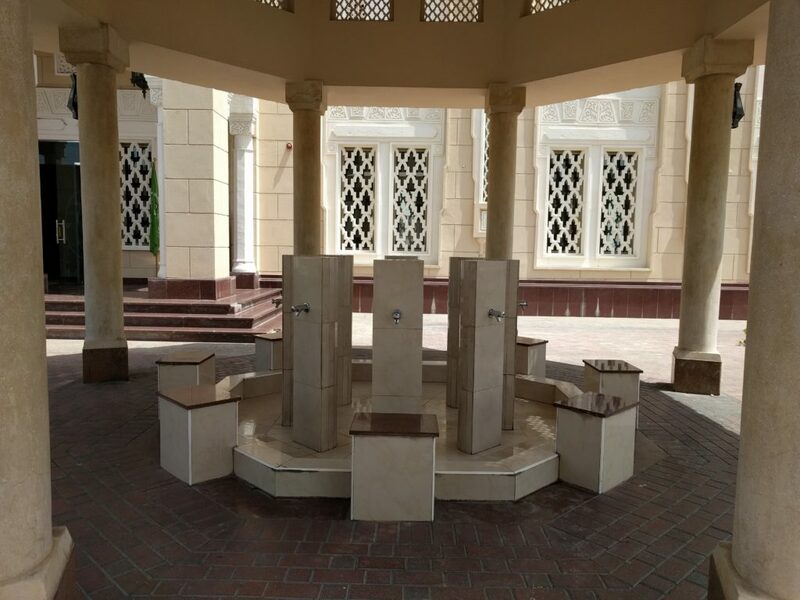 In front of the Sheikh Mohammed Centre for Cultural Understanding is the area where Muslims perform their cleansing ritual, also known as Wudu or Ablution, before entering the mosque. They perform this ritual before praying, whether in a mosque or elsewhere. It was explained and demonstrated during our tour. 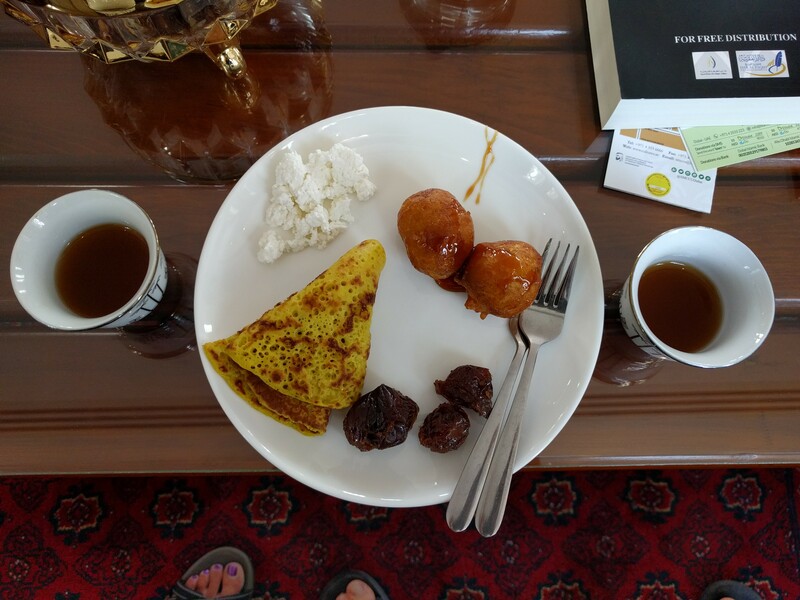 We enjoyed traditional Arabic snacks before our tour of and presentation within the mosque. Entrance of the mosque – Part I of II (see below) – I could not get it all into one photo, it is so big! Muslims pray facing toward the Kaaba, the building at the center of Islam’s most sacred mosque, in Mecca, Saudi Arabia. 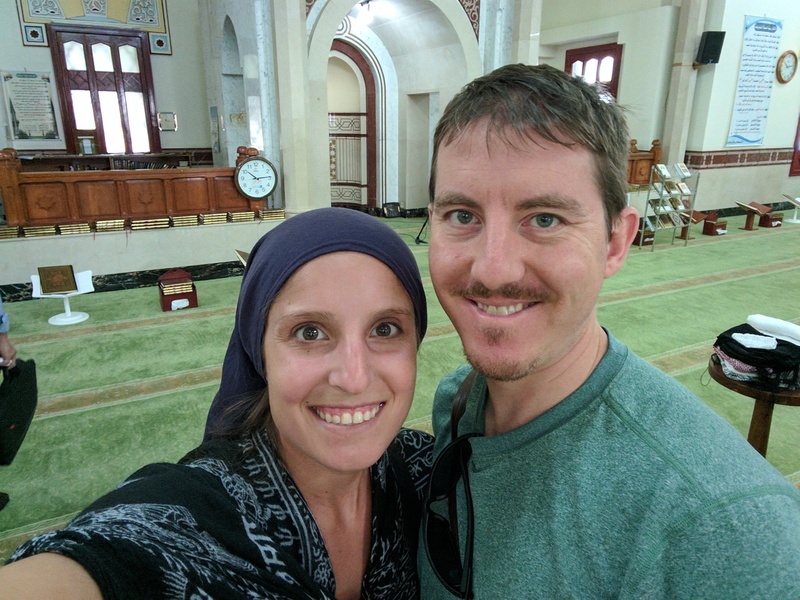 Mosque selfie! We dressed modestly as requested. Women also were asked to wear headscarves; I wore a multi-use material I usually use as a neck warmer (of course, it’s purple). 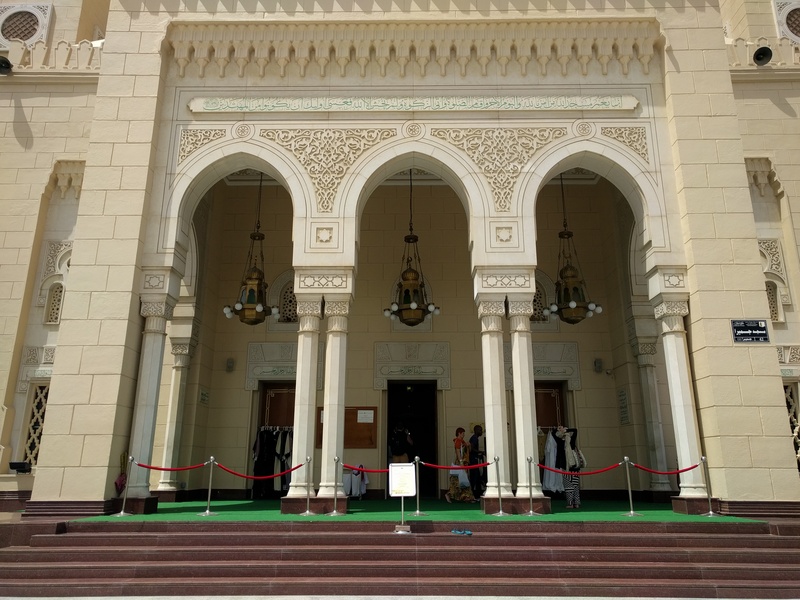 There were garments available to borrow for those who were not dressed appropriately to enter the mosque. Shoes are to be removed before entering. When the sun rose and the five times of prayer for that day are shown here. Muslims believe in one God, and only He is deemed worthy of worship. The word for God in Arabic is, “Allah”. Muslims recognize Jesus as a Prophet, not as the son of God. They believe Prophet Muhammad was the last Prophet sent by God. After our presenter said his name, she always followed it with, “Peace be upon him”. 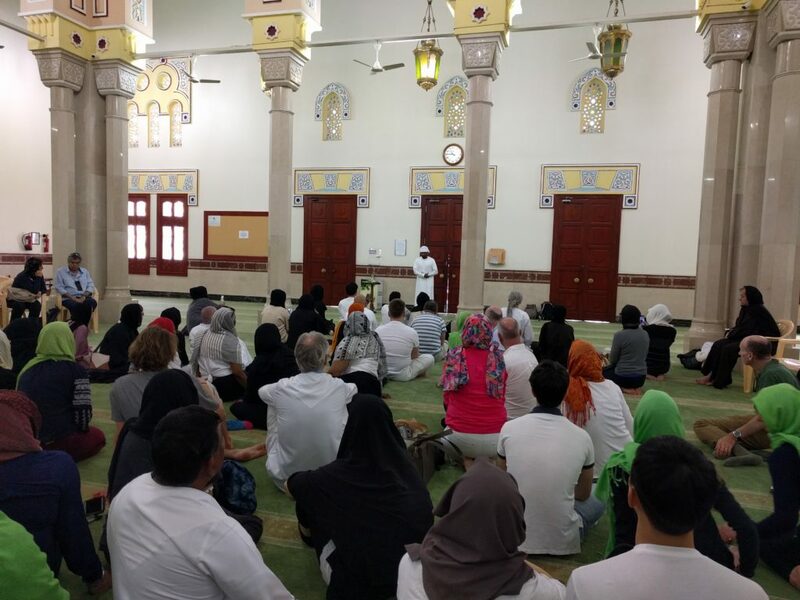 Fridays are the weekly day of prayer for Muslims where they gather at mosques to pray together. Inside, women and men pray in separate areas. 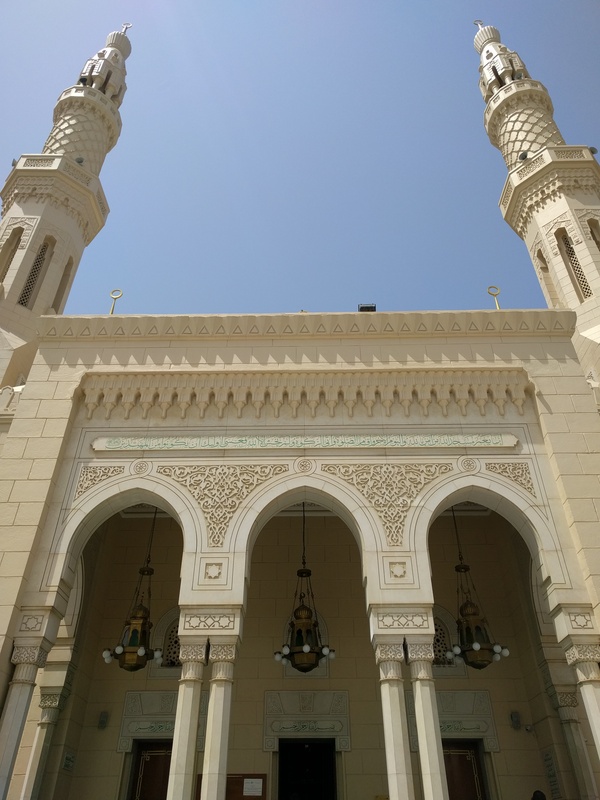 There are Five Pillars of Islam: Testimony of faith, prayer, giving zakat (setting aside a small percentage of earnings annually for the needy — it can also be used to help out a struggling friend or family member), fasting during the month of Ramadan, and making a once-in-a-lifetime pilgrimage to Mecca (if physically and financially able). Muslims believe in the Day of Judgment. 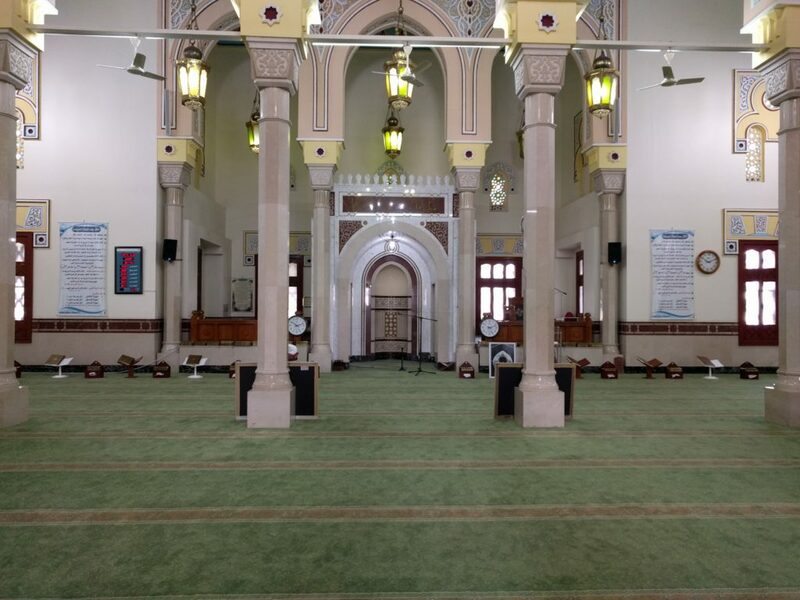 I walked away from this experience with a greater sense of not only understanding, but respect, for Muslims; for the consistent discipline they have to actively practice their religion throughout the daily calls to prayer, following the modest standards of dress, and more. Also, the woman who led the tour, presentation, and Q&A session was very kind, gentle, and open in her communication style, which added to the positive, welcoming feel of our experience. After our morning spent at the mosque, we attempted to walk to a nearby beach. Due to construction, we were not able to figure out how to get around the obstructions to it. In the heat of the day and ready to eat lunch soon, we decided to pass on walking along the beach and seeing the ocean. 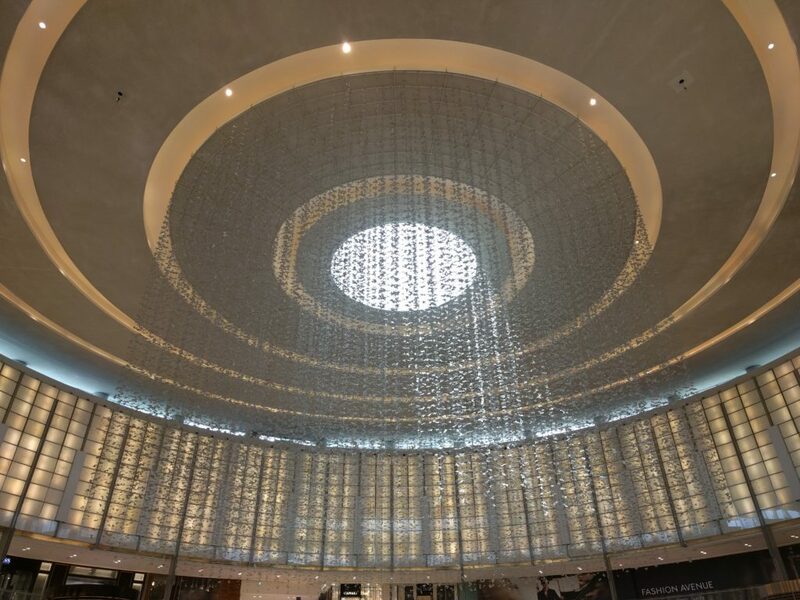 We requested an Uber ride to a heavenly haven from the dry heat and guarantee for a moderately-priced and casual meal — Yep, you guessed it, another mall! The Dubai Mall is apparently the largest in the world (by total area)! We spent a good part of our afternoon walking around in this air-conditioned environment. It felt like more of an upscale shopping destination, featuring many high-end brand names and department stores. We appreciated being able to move around a bit, since we’d had a fairly sedentary day the day before at the airport and on the plane, but a wave of tiredness hit us in the late afternoon due to jet lag (Thailand is 3 hours ahead of the UAE), plus I was getting through the tail end of the common cold. A highlight of exploring the mall, for us, was seeing all the cool displays, which we were memorized with and considered to be pieces of public art. 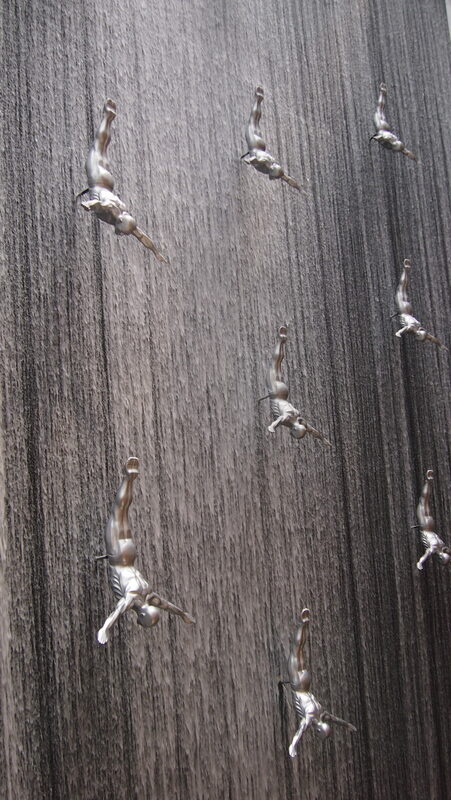 This a fountain; that’s water running behind the figures. 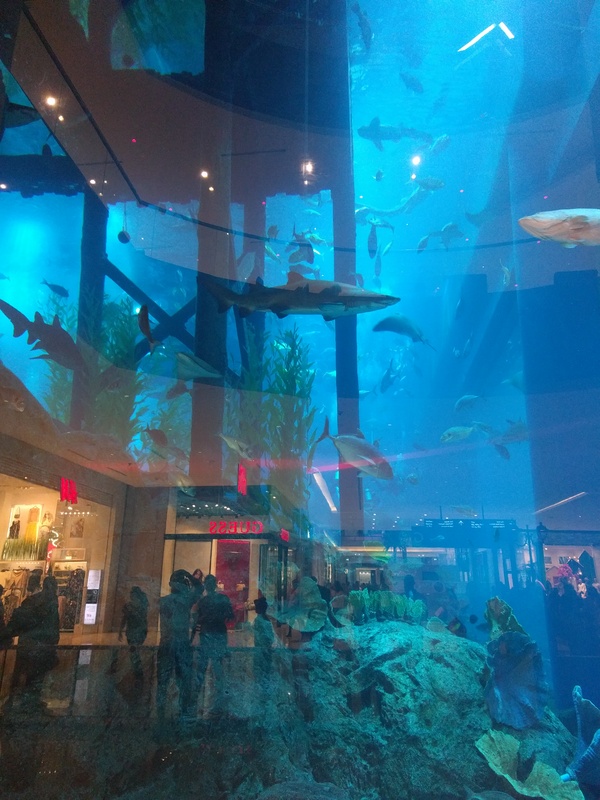 The Dubai Aquarium & Underwater Zoo is at the mall, which we didn’t go into because we didn’t want to pay for it, as the cost was steep [the tickets started at AED 100 per person, which is almost $30 USD each]! However, we did observe the activity going on in the tank outside of its entrance, which features fish, stingrays, and even sharks! They must be tame sharks because people were scuba diving in there with them! Of popular sights to see in Dubai, the Burj Khalifa is among the most well-known. 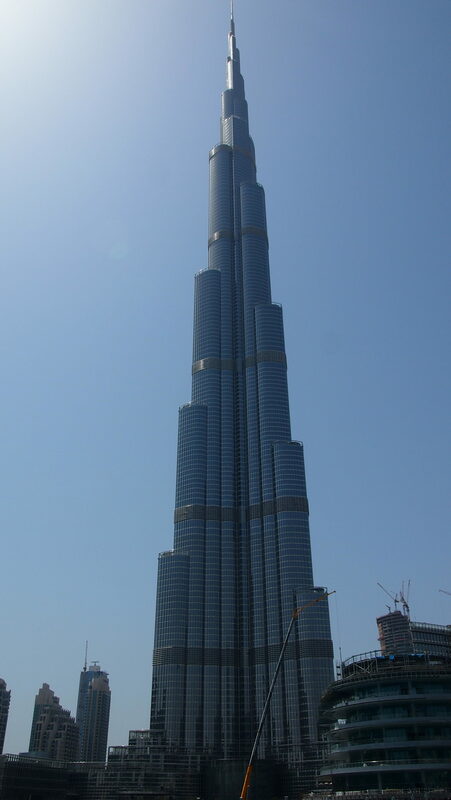 It’s the tallest building in not only Dubai, but it’s also the tallest skyscraper in the world! Once again, we felt the high prices weren’t worth paying to go inside (AED 125 to AED 350 each, or about $34 USD to $95 USD each, depending on how high up you want to go), but we enjoyed taking in the view of it among the skyline from just outside of the mall. The Burj Khalifa in all its glory! I was participating in a push-up challenge while we were in Dubai, so I completed my push-ups with the skyline and Burj Khalifa in the background! My palms were red from pressing them against the bench, which the sun had been directly beating down on, after just seconds of contact (worth it for this video footage)! We requested an Uber ride back to our hotel, and while waiting in the designated spot for the driver in the parking garage area, I walked in and out of an adjacent air-conditioned building for some relief from the heat that enveloped me. Unfortunately, the driver never arrived, as he was insisting he was there and he wasn’t, so after he and Aaron went back and forth for awhile, he eventually canceled the ride but still charged us for it (which we brought to Uber’s attention, and they refunded it to us). We ended up taking a taxi cab back. 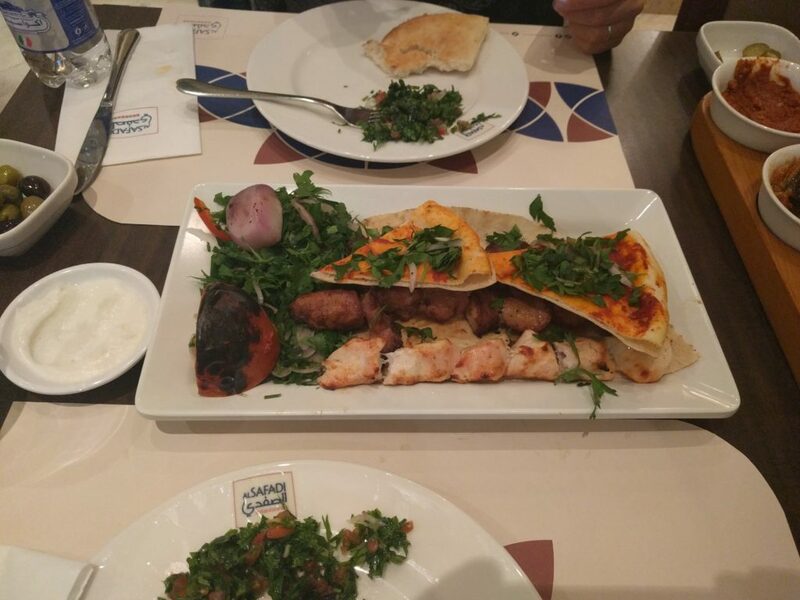 We chose to try Lebanese food from Al-Safadi Restaurant, which was walking distance from our hotel. 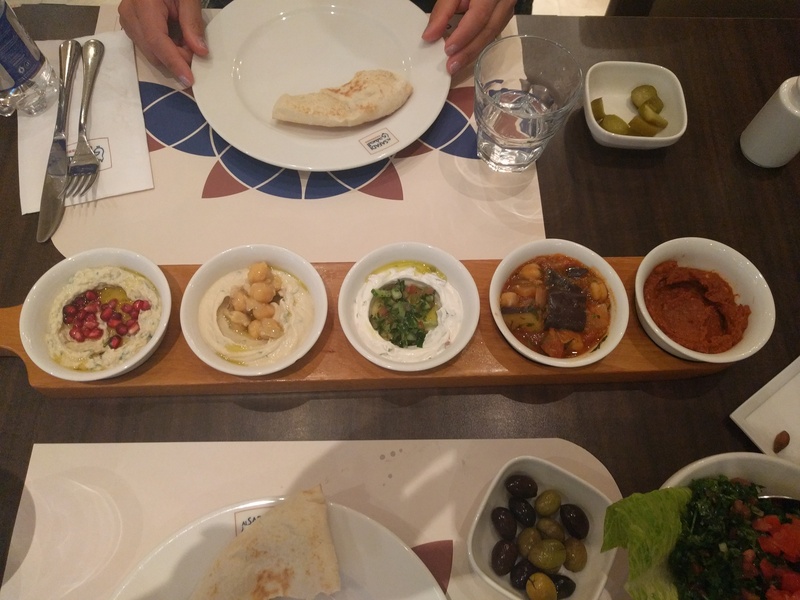 We left feeling very full and pleased we got a taste of Middle-Eastern cuisine, which in some ways is similar to Mediterranean cuisine. Warm pita bread served for dipping into this sampling of traditional dips… Mmm! 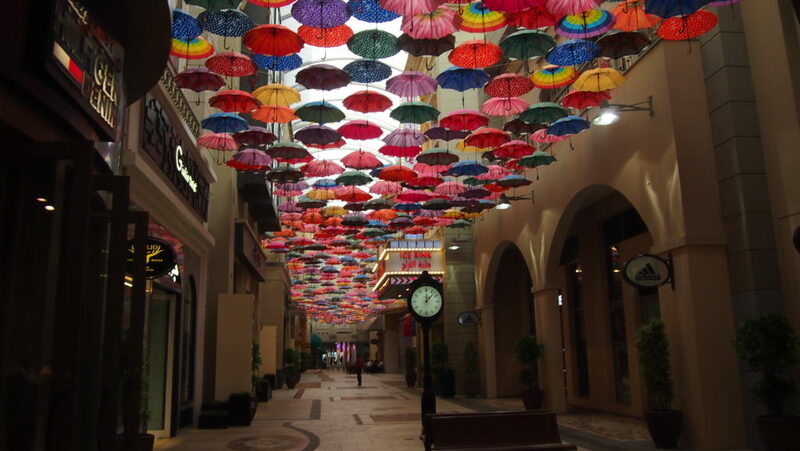 Dubai is an interesting city, a sort of melting pot (no pun intended!) of the Middle East. There are people living there and visiting from all over parts of the Middle East, and really, from all over the world. As I’ve mentioned throughout this post, the heat in Dubai is hot, but dry, as one would imagine a city in the Middle East to be. I prefer it to the humid heat we had just left back in Thailand, but it’s still hot; the sweat just builds a bit slower and my skin isn’t clammy and sticky. While Islam is the official religion, the emirate promotes having a tolerance and respect for all religions. The standards for dress are modest, but as there are many international visitors and expats, a wide variety of attire can be seen. Still, we’d never noticed so many men and women in one place dressed so traditionally; it wasn’t our normal, so it truly stood out to us. Personally, I chose to cover my shoulders, knees, and hair because it felt more comfortable for me, as I was trying to be respectful of what I perceived to be the social, cultural, and religious norm and didn’t want to draw any extra attention to myself for not following it (although again, plenty of people were not doing this and it didn’t seem to be expected, generally, outside of the mosques, although the malls did have signage that suggested modest dress was required inside, though it was not enforced from what we could tell). Also, I wanted to experience what it was like for myself to dress this way (it was pretty nice to have my hair completely out of my face for the day, and I can see the appeal of not worrying about what your hair looks like — which applies more to my normal life back at home than my life on the road, because these days, my hair is crazy all the time)! 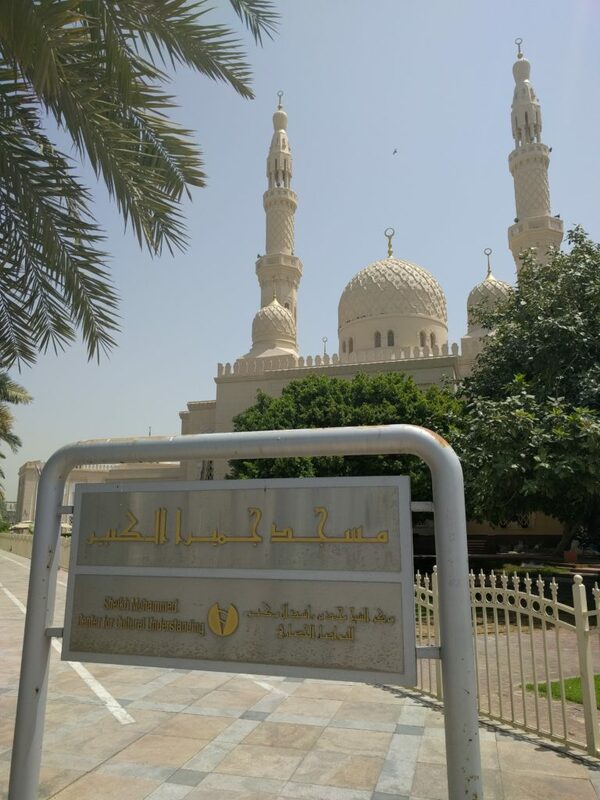 The most fascinating part was visiting the Jumeirah Mosque through the Sheikh Mohammed Centre for Cultural Understanding and learning more about what it is (and isn’t) to be Muslim. Especially in the U.S. today, there are so many misconceptions about Islam, and I feel that many people are misinformed about it. My former boss, Sally, has a general life philosophy, both professionally and personally, to try to “seek to understand” and encourages others to do so as well. These words have really stuck with me, and I think it applies here. It feels good to personally take the time to listen and understand a religion, culture, and worldview different from my own, stepping outside of my immersion in mainstream, Western society, as an American, Christian, and someone who generally leans to the left; there are actually more similarities than I had imagined there to be. I understand there are some major differences between Islam and Christianity, for example, but both religions are based on recognizing and worshipping one God, both call their followers to be humble and charitable people, both have communities built upon commonly-held beliefs and ways to live, and both teach loving and respecting God, others, and oneself. 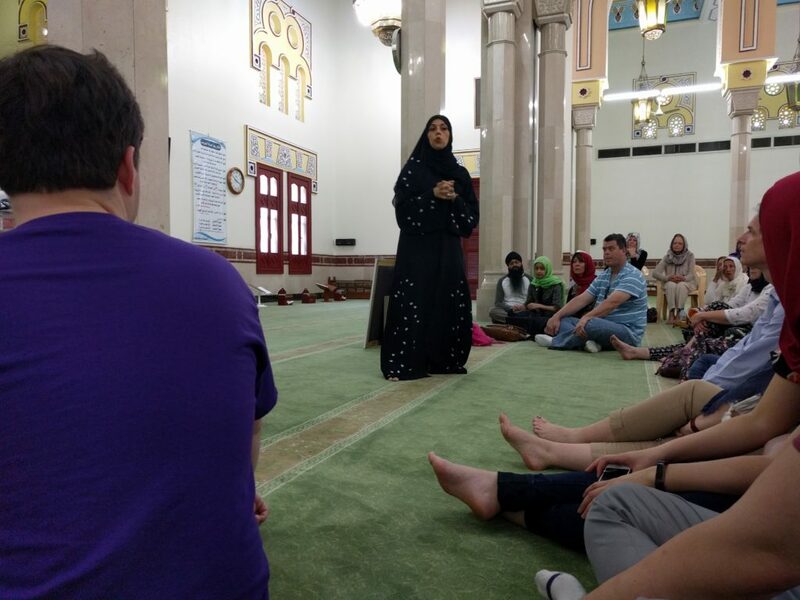 In the Q&A portion of our time at the mosque, where people could ask whatever they wanted, something happened that profoundly impacted me. Some guy asked our presenter what she thinks about the Muslim terrorists, a topic that in today’s world, in this setting, is the elephant in the room. She briefly paused, mindfully collecting her thoughts, before carefully and bravely explaining herself with a deliberate and even tone. I thought her response was very thoughtful and true. She said (basically) that there are people out there who use the name of every major world religion to radically turn it into something that it isn’t, something that is a platform to further their own agenda. That is what terrorist groups out there have done, and they are not Muslim. That it is those evil people against the rest of the world, not the world against Muslims (or insert other religion). Everyone applauded her, including us. To truly be Muslim is to live to honor God, and nothing in their religious teachings encourages causing intentional harm to, or furthermore, killing people, to please God. I think there is a general lack of understanding, or even willful ignorance, around what it is to be Muslim, by those in the U.S. who think for whatever reason Muslims should be singled out/targeted, and especially by those who commit public, violent acts against peaceful, innocent Muslims minding their own business, going about living their daily lives. As if they did something wrong to deserve this treatment just because they are Muslim. As if they are like those terrorists. I wish everyone could experience something like what we did in Dubai and open their minds, hearts, and ears up to listen and seek to understand. I don’t claim to have answers about what the right ways to approach fighting terrorism are, but I know targeting an entire religious group and imposing discriminatory practices against them just can’t be. How is this different from singling out any other ethnic or religious group as a whole, making a generalization about what people from that particular group must be like and imposing unequal, unfair treatment upon them? How does this promote the religious freedom our country stands for, without fear of persecution for beliefs? Next, we continue our journey in Athens for a whole month, where we had initially arranged to volunteer teaching English to refugees primarily in our time there, but our plans unexpectedly fell through soon after our arrival. Stay tuned to find out how we spent our time there instead!